1937 was a big year for Alice Faye. She starred in no less than five films that year, including In Old Chicago, On the Avenue, You Can't Have Everything, Wake Up and Live, and the topper for the year, You're a Sweetheart. 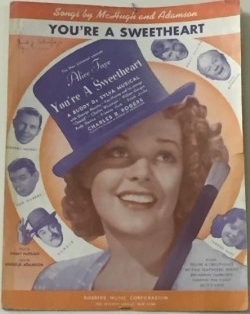 You're a Sweetheart was a musical comedy directed by the inestimable David Butler (full disclosure, we were unfamiliar with Mr. Butler before exploring his contribution to You're a Sweetheart, but his career was closely linked to that of Miss Doris Day). The movie is about a Broadway producer who is competing with a charity event for the debut of his show and does whatever is necessary to get New York's elite to attend. Don't worry, this film isn't about the plot. It's about the music. With five songs written and composed by Jimmy McHugh and Harold Adamson, the title track is the one we're recognizing today. Since the sheet music for this song is displayed right here, at the American Treasure Tour, in our Music Room. Let us know if you can find it the next time you come in for a visit!